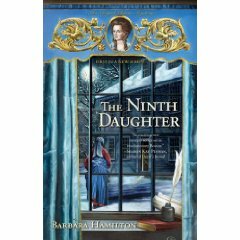 The Ninth Daughter by Barbara Hamilton. Berkley Trade, 2009. This is my second March entry in the 2010 reading challenge Year of the Historical. In 1773 Boston, Abigail Adams goes to visit Mrs. Rebecca Malvern and instead discovers the corpse of a woman face down on the floor. At first Abigail fears it is her friend but she soon realizes that the body belongs to a stranger. Her relief is short-lived however because Rebecca Malvern has disappeared. Aware of Rebecca’s ties to the Sons of Liberty, an underground organization of patriots, Abigail calls Samuel Adams to clear away any incriminating evidence before the British are aware of the crime. But Samuel is distressed to find that Rebecca is not the only one to disappear – gone too are a book of ciphers which contains the pen names used by the Sons of Liberty to submit articles and challenge British authority. Set during the tension between the British and the Sons of Liberty that will culminate in the Boston Tea Party, the situation grows worse when John Adams is suspected of the murder. It is up to Abigail to find her friend Rebecca and solve a murder in order to clear her husband’s name. Although The Ninth Daughter focuses mainly on Abigail, many other historical figures play minor roles. Abigail meets with noted Sons of Liberty Samuel Adams, John Hancock, and Paul Revere, and the rest of the Adams family (husband John, daughter Nabby, and son Johnny) are also included in the novel. While it is well-known that Abigail Adams addressed her correspondence with her husband to “My Dearest Friend”, the pen names she used, and that Hamilton uses within the story, were new to me. Historically, John and Abigail began corresponding during their courtship and continued to write letters back and forth throughout their marriage when separated by distance. Abigail was just seventeen and John twenty-six when they began writing to one another, adopting pen names as was the custom. While John called himself Lysander, after the Spartan war hero, Abigail was named Diana, for the Roman goddess of the moon. She addressed her letters then as she famously would for the rest of her life to “My Dearest Friend.” After they married and had begun a family, Abigail changed her pen name to Portia, wife of the Roman politician Brutus. What Barbara Hamilton does so well is to recreate the atmosphere of the times. She not only includes period details like the work being done, but also offers descriptions of the sounds and smells of 1770’s Boston so that the reader feels a part of the era. The tension between the British and the Sons of Liberty can be felt throughout the novel and Hamilton does a great job of building up to what will be known as Boston Tea Party. When it comes to historical sleuths Abigail Adams is an inspired choice. Feisty, opinionated, and smart, she makes a great protagonist and, just as importantly, Hamilton writes her well. Abigail’s thoughts and words reminded me of the passionate woman portrayed so wonderfully by Laura Linney in the HBO miniseries John Adams, and as I read I could hear Linney’s Abigail in my head speak each line. Hamilton also does well to include Abigail’s social and political thoughts on the rights of women and slaves in a subtle but noticeable way. The mystery itself was interesting and enough clues were given that the reader can take on the amateur sleuth role alongside Abigail. This is the first of a planned series and I look forward to reading more Abigail Adams mysteries in the future. Verdict: Atmospheric with an intelligent and realistic historical protagonist. Well worth a read.